We were a proud sponsor for the Rowland Heights, Ca Here Comes Santa event at Rowland Heights Park. Over 500 children received a toy from Santa and Mrs. Claus and a picture! 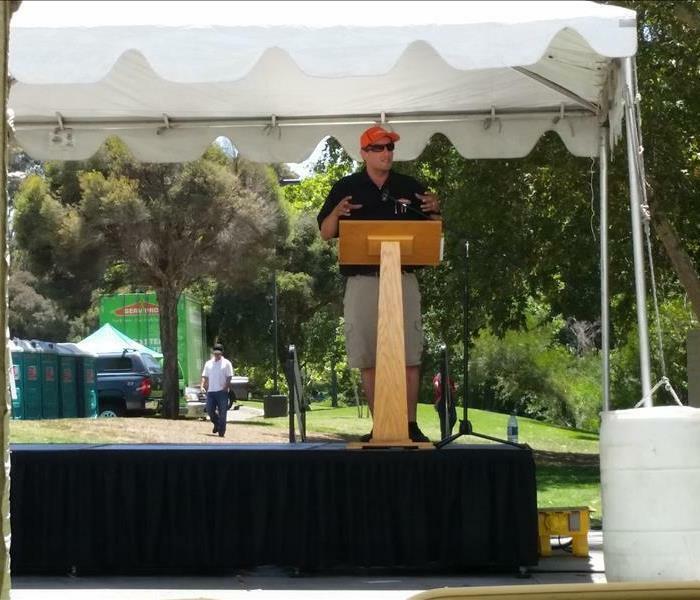 SERVPRO is proud to support our Hacienda Heights community! We were a proud sponsor for the Rowland Heights, Ca Here Comes Santa event at Rowland Heights Park. 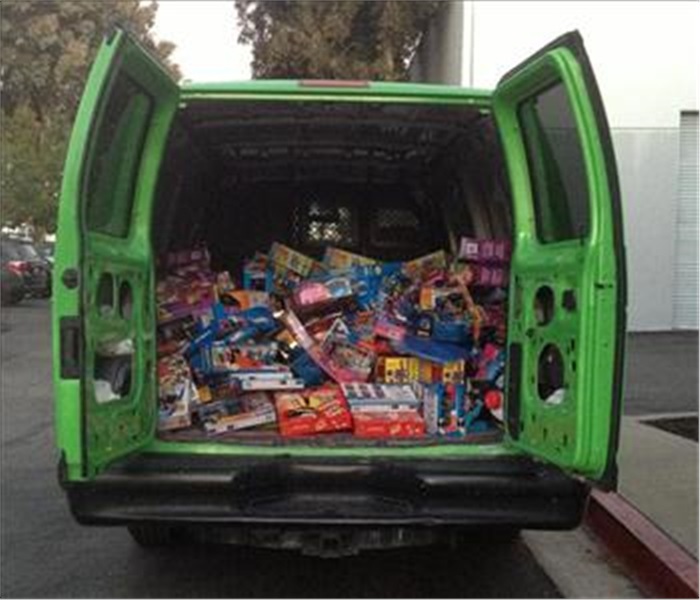 Loaded our van up with over 250 toys to donate for a wonderful community event! 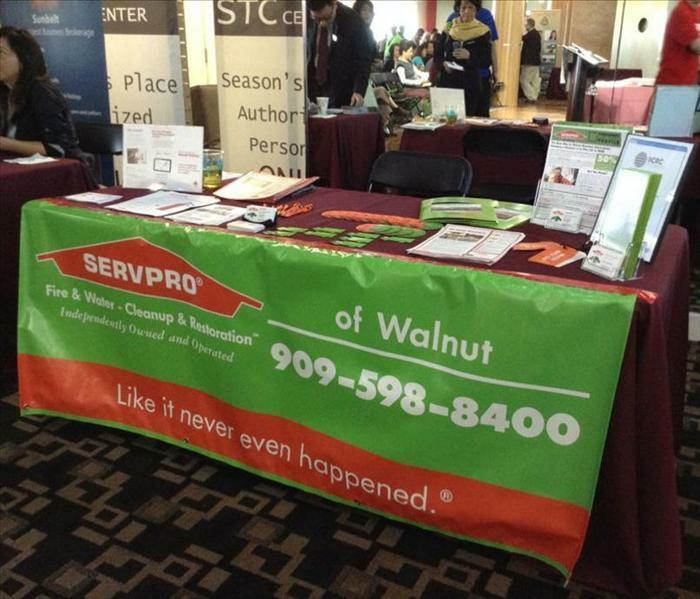 SERVPRO is proud to support the Walnut Community! 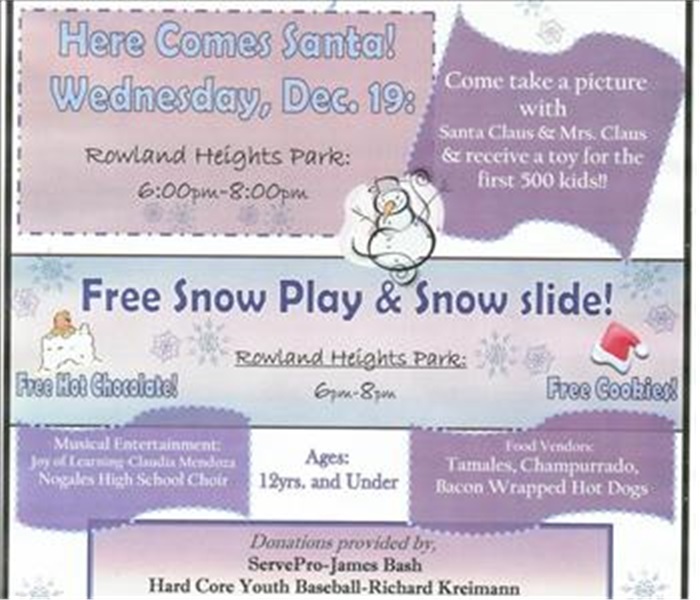 We were a proud sponsor for the Rowland Heights, Ca Here Comes Santa event at Rowland Heights Park. Unloading over 250 toys to donate for a wonderful community event! 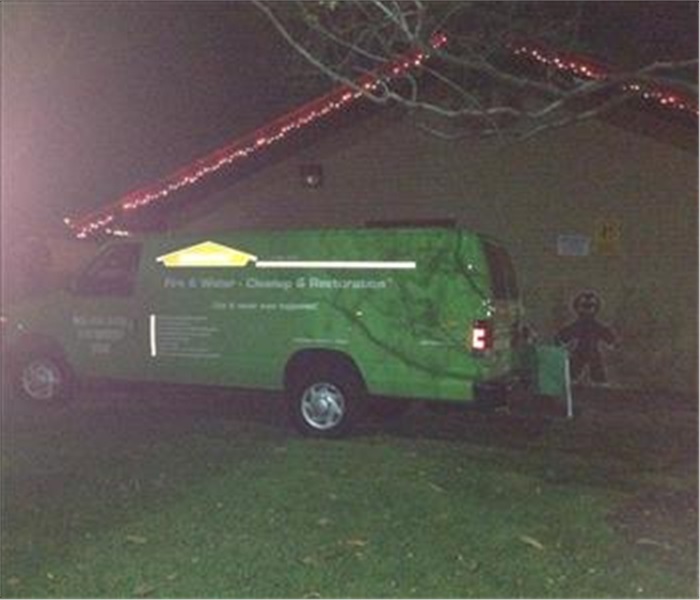 SERVPRO is proud to support the Hacienda Heights Community! We were a proud sponsor for the Rowland Heights, Ca Here Comes Santa event at Rowland Heights Park. Over 500 children waiting in line for a photo with Santa Claus and Mrs. Claus and to receive a toy! 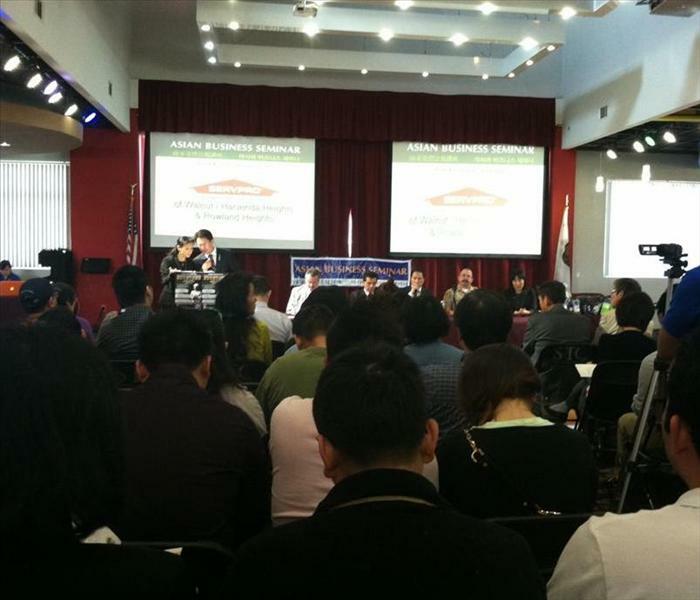 Production Manager, Jacob Menchaca educates our local insurance agents about water damage at our Restorative Drying for Water Damage 2Hr CE Class on April 17,2013 (Rowland Heights, CA). 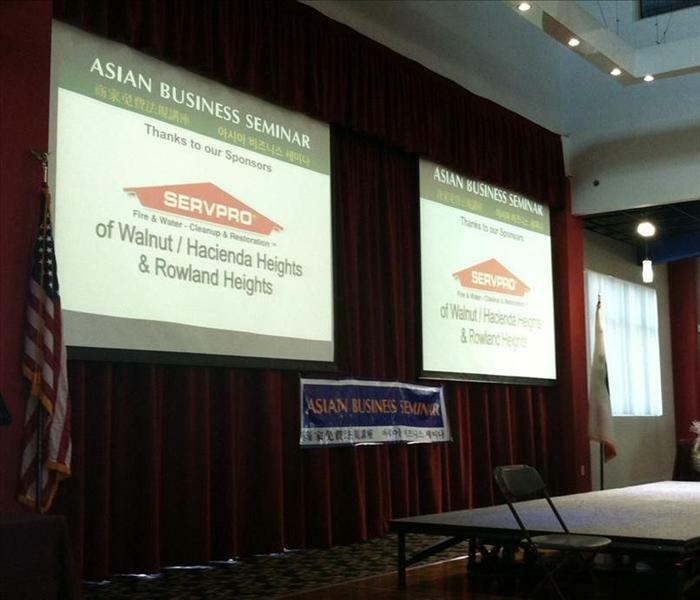 On March 15th, SERVPRO of Walnut & Hacienda Heights helped sponsor the 2nd Annual Asian Business Seminar at STC Center in Rowland Heights. Los Angeles County Supervisor Don Knabe collaborated with STC Management, San Gabriel Valley Regional Chamber of Commerce, San Gabriel Valley Economic Partnership, Los Angeles County Economic Development Corporation, and the Korean American Economic Development Center to gather the attention of hundreds of Asian small business owners. Congressman Ed Royce also expressed support for Rowland Height’s and Hacienda Height’s constant growth of Asian businesses. 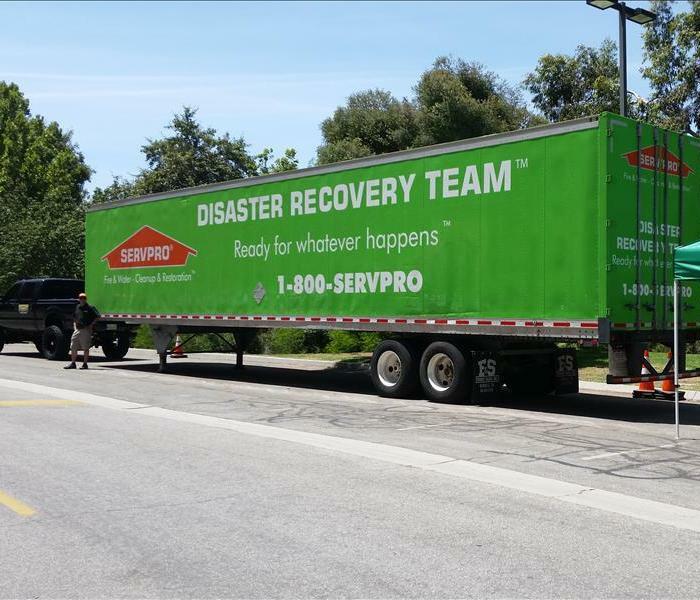 The SERVPRO Disaster Recovery Trailer at the 2014 Emergency Preparedness Fair at Schabarum Park in Rowland Heights. 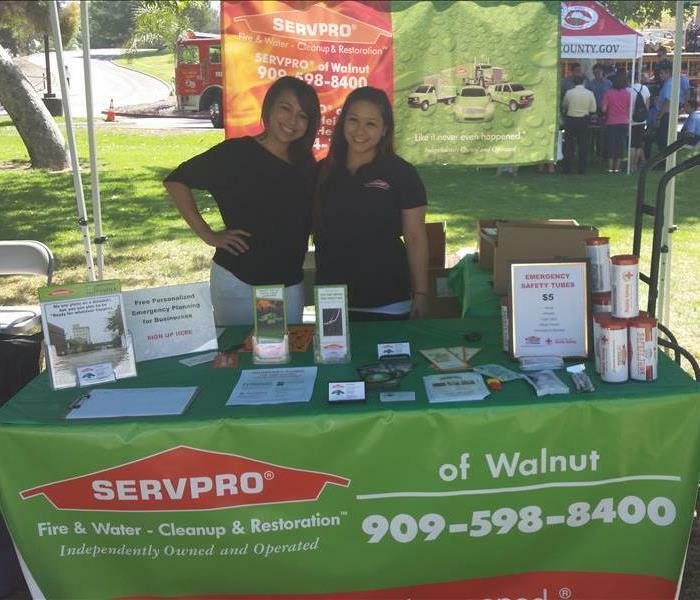 Nikki & Nicole running the SERVPRO of Walnut/ Hacienda Heights & Rowland Heights booth and the Emergency Preparedness Fair on June 21, 2014 at Schabarum Park (Rowland Heights). 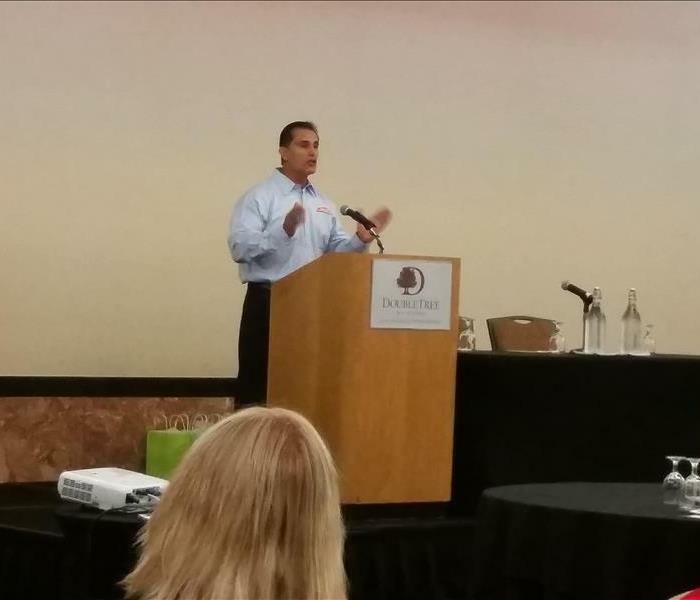 Jacob Menchaca spoke to the attendees of the Emergency Preparedness Fair about cleanup, restoration, emergency planning and how to prevent/reduce damages to your property when disaster strikes. 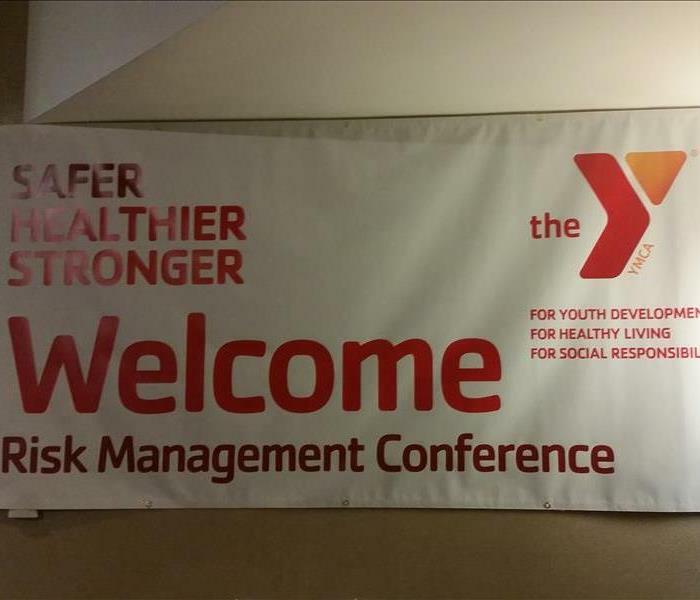 Servpro of Walnut & Hacienda Heights/ Rowland Heights spoke about the importance of being prepared for disaster and introduced Servpro's Emergency Ready Profile at the 2014 YMCA Risk Management Conference in Los Angeles on September 17, 2014. It was a beautiful day at the Annual Walnut Family Festival on Saturday, October 11, 2014. 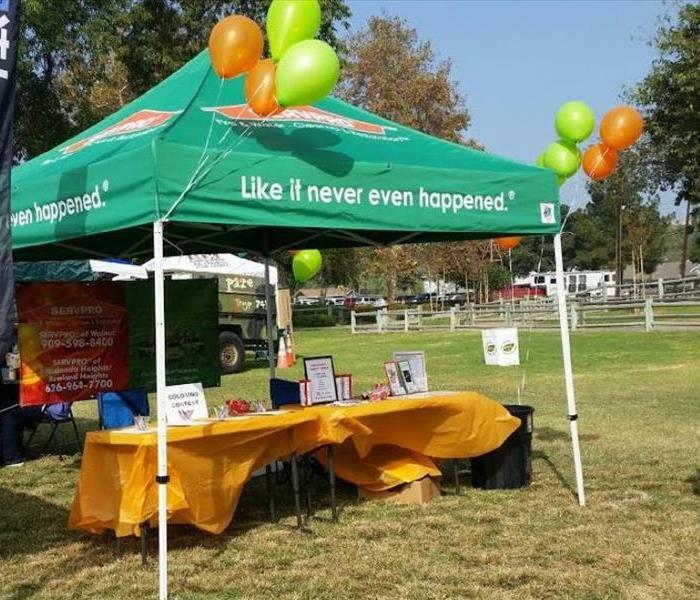 SERVPRO of Walnut / Hacienda Heights & Rowland Heights participated for its second year in the Emergency Preparedness Fair on Saturday, May 2nd, 2015 in Rowland Heights, CA. 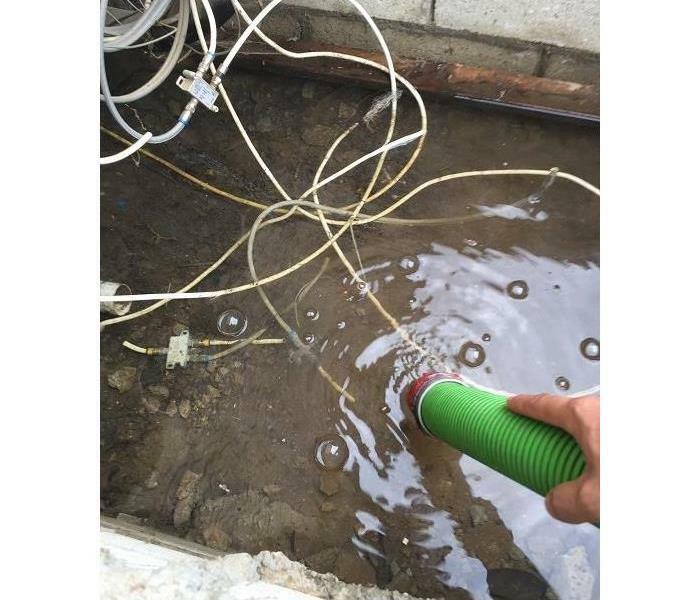 SERVPRO of Walnut/ Hacienda Heights & Rowland Heights re-located to a bigger facility in Walnut on March 27, 2015. We celebrated with the community by hosting a Casino Night to raise funds for the Hacienda Heights Kiwanis Club and the Los Angeles County Fire Department Explorer's program. We raised and donated over $400 towards these local programs.